But Die From An Epidemic in Quebec. 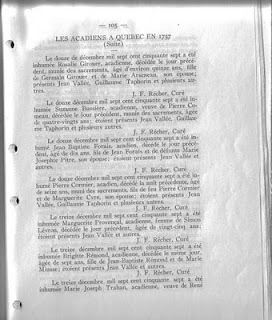 The photocopied page below is one of many listing the names of the Acadians who died in 1757 in Quebec. These Acadians had managed to escape the deportation in 1755 when the British set out to exile all of the Acadians from their lands. Some of those Acadians who died in 1757 were among those who were about to be deported on the ship Pembroke when it was overtaken by the Acadians. They then set sail for the St John River/Rivière St-Jean where they remained until they heard the British were coming to capture them. They set fire to the Pembroke and headed up to Miramichi. Food was scarce at Miramichi and some were dying of starvation so many of those Pembroke Acadians decided to continue on to Quebec only to be decimated during the epidemic that ensued. They had been through so much and in the end when their freedom was assured so many of them died. On the twelfth of December seventeen hundred and fifty-seven was buried Rosalie Girouer (Girouard), Acadian, who died the previous day, having received the sacraments, approximately fifteen years of age, daughter of Germain Girouer and Marie Arseneau, his spouse; present Jean Vallée, Guihaume Taphorin and many others. On the twelfth of December seventeen hundred fifty-seven was buried Suzanne Bussièere, Acadian, widow of Pierre Comeau, who died theprevious day, having received the sacrements, eighty years of age. On the twelfth of December seventeen hundred fifty-seven was buried Jean Baptiste Forais (Forest), acadian, who died theprevious day at the age of six years, son of Jean Forais and deceased Marie Josephte Pitre, his spouse. On the twelfth of December seventeen hundred fifty-seven was buried Pierre Cormier, Acadian, deceased the previous night sixteen years of age, having received the sacrements, son of deceased Pierre Cormier and Marguerite Cyre, his spouse. This information comes from "Recherche Historiques" published by Pierre-Georges Roy, Volume Thirty-Six published in 1930. These Acadians remnants of an unjust war have no tombstones but the lack of such should not allow us to remember them any less even though they lay in unmarked graves. I am interested in this group of Acadians because I'm descended from Joseph Richard, who died in December 1757 with three of his children, and Madeleine Leblanc. His two older children lived and later married in the Nicolet area, but I don't know if they were in Quebec then or if they were with other family members somewhere else. I don't believe this family was on the Pembroke, they were from Beaubassin. The parents of Joseph (dit Canadian) Richard were exiled to Massachusetts as were some of his siblings. In fact, a couple of them died while in exile. In Joseph's case, he had obviously escaped to Quebec early on given his death on 13 December 1757. His wife Madeleine LeBlanc dued 01 June 1788 at Bécancour. After the death of her husband she married a second time to Joseph (Prince) Leprince on 26 October 1761 at Ste-Croix, Lotbinière, Quebec. Interestingly enough, Madeleine's parents had also been exiled to Massachusetts and made their way to Quebec post exile where they both died. Hi Lucie: I've seen your name everywhere on the internet... I've completed a novel that doesn't only give the history - but tells the story of how the history actually affected the people. I hope as many people as possible read it - not to make money for me - but to get the story out. Would you consider providing a link to my website? Lucie, did ALL the Pembroke survivors die of Smallpox? Hi Genevie! Thank you for your post. All of the Acadians on the Pembroke did not die of smallpox once in Quebec. I'm researching the same line as Caroline, Joseph Richard (d.1757) and Madeleine LeBlanc (d. 1788). I'm trying to correctly follow this line and find out what happened to each of his children and not just my direct line. Where can I research information on the deportations, and more about all of them as individuals?